Gabon Kiōng-hô-kok (Hoat-gí: République Gabonaise) tiàm-tī Hui-chiu ê kok-ka. Keh-piah kok pau-koah Congo Kiōng-hô-kok, Cameroon kap Chhiah-tō Guinea. 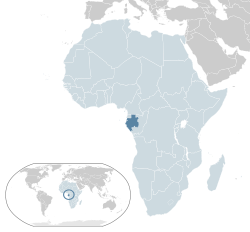 Sai-hōaⁿ chiap Guinea-oan. ↑ Department of Economic and Social Affairs Population Division (2009). "World Population Prospects, Table A.1" (PDF). 2008 revision. United Nations. March 12, 2009 khòaⁿ--ê.
Chit ia̍h siāng bóe tī 2017-nî 12-goe̍h 3-ji̍t (Lé-pài), 08:09 ū pian-chi̍p--koè.